Check this out, a special episode of Wordgirl for April Fools Day. WORDGIRL – The Handsome Panther – Chuck is tired of the same old sandwich-related crimes so he develops a new persona: The Handsome Panther! He’s ferocious and he even has a theme song. Will WordGirl be thrown off by Chuck’s new identity? The Butcher, The Baker and the Candlestick Maker – Rub a dub dub! The Butcher and his old pals, The Baker and The Candlestick Maker, try to relive the good old days of pulling silly pranks. But can the Butcher resist his truly evil ways when WordGirl shows up on the scene? Then, on April 6, new from Super Why! SUPER WHY! – Peter Rabbit- Peter Rabbit – Red wants to find the perfect present to show Grandma she cares, but she is absolutely stumped! The Super Readers pay a storybook visit to Peter Rabbit and chase after the mischievous little cottontail bunny, who’s on the hunt for some delicious fresh vegetables for his Mama. The Super Readers must help Peter find what he’s looking for before his big appetite for veggies lands him in hot water! As a long time fan of the outstanding literature-based films from Weston Woods studios, I have loved the new collections that Scholastic has released this year. The newest one, to be released March 31 is a collection of stories on DVD created especially for children ages 2 to 6. MY VERY FIRST TREASURY OF 50 STORYBOOK CLASSICS: PRESCHOOL STORIES features many all-time children’s classics, faithfully adapted and brought to rich, entertaining life in a brand-new 7-DVD set. Celebrity narrators (Mia Farrow, Anthony Edwards, the Bacon Brothers and others) and peerless production values combine to create a high value, long-lasting experience for young viewers. The Scholastic Storybook Treasures series “gives viewers a new way to look at books,” says Scripps Howard News Service. And from the wild imagination of HAROLD AND THE PURPLE CRAYON and the sing-along favorite THERE WAS AN OLD LADY WHO SWALLOWED A FLY to Mo Willems’ new classic KNUFFLE BUNNY, the 50 beloved, best-selling children’s book adaptations in MY VERY FIRST TREASURY OF 50 STORYBOOK CLASSICS offer more than seven hours of quality children’s entertainment, colorfully whimsically animated and kid-tested. Librarians and teachers around the country have long been using these very same productions, created by Weston Woods Studios with authors and illustrators, to enhance their students’ pre-reading experiences. And this new compilation collects the best stories that are perfectly targeted to preschool children who can already read picture books, or are just learning about letters and words. 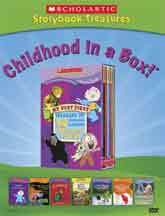 Also on March 31, Scholastic Storybook Treasures will release three of these newly repackaged and refreshed DVDs individually: THE EZRA JACK KEATS COLLECTION, THERE WAS AN OLD LADY WHO SWALLOWED A FLY…AND MORE SING-ALONG FAVORITES and IS YOUR MAMA A LLAMA?…AND MORE CLASSIC CHILDREN’S STORIES. The adventures continue with everyone’s Number 1 engine when Thomas & Friends™: High Speed Adventures races onto DVD March 31, 2009. Teaching timeless life lessons such as discovery, friendship and cooperation, the Thomas & Friends animated series invites children to enter a world of imagination through the tracks of a train and the words of a story. Thomas and his engine friends speed through the Island of Sodor in six spectacular stories of fun and adventure. Capture the spirit of ‘steamwork’ as Thomas learns to share his workload, Edward saves Gordon at the water works and Rosie learns to follow directions to get the job done. Future engineers will hear about Proteus the mystical engine, see Henry help woodsmen save the Sodor Wishing Tree and thrill as Thomas takes on the challenge of a high-speed race! Grab your conductor’s hat and hop on board for this action-packed collection of High Speed Adventures! Jennifer Aniston and Owen Wilson unleash huge laughs as John and Jenny Grogan, a young couple contemplating the decision to have a baby. John gives Jennifer a puppy in an attempt to stall off the pending idea of parenting. 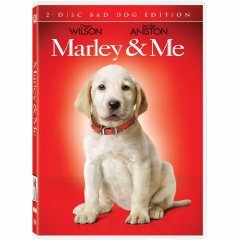 Marley is an adorable Labrador pup who flunks obedience school and quickly turns his new home into a disaster area. The rambumnctious little puppy becomes a rambunctious 100 pound dog. But as mischievous Marley sees the Grogans through the ups and downs of life and love, they ultimately realize that “the world’s worst dog” truly brings out the best in them. This film, based on the novel by Josh Grogan, draws you into the storyline from the get go. Aniston and Wilson make a very believable couple. Audience members might want to think about a couple of things before they go to see this. First of all, this film is not just a dog movie; the storyline really revolves around the couple and their family. The dog’s involvement is integrated into the story but he’s not always the center of attention. The ending is sad, but true. Anyone who has ever lived with a pet can relate to losing the pet at the end of its life. But, it is part of living with a pet. My eight-yar-old grandson turned to his mother and aunt who were in tears at the end and tried to comfort them by saying, “it’s just a movie guys, the dog doesn’t really die.” Sometimes I think that kids handle things like this better than adults do. At the very least, we might look at why we hide them from this type of death which really does happen while we, as a culture, are so keen to expose them to the types of fictionalized and romanticized and often gruesome death that takes place in so many action-adventure films. I say, kudos for making a film that deals with the type of situation a child is likely to encounter in real life. It’s okay to have tears when we feel sad and yes, it is only a movie. The dog didn’t really die. Starring Owen Wilson, Jennifer Aniston, Eric Dane, Kathleen Turner, Alan Arkin, Nathan Gamble, Haley Bennett. 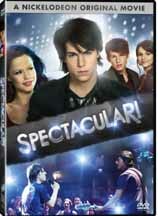 Get ready to rock the house when Nickelodeon’s highly anticipated original TV movie, Spectacular!, comes to DVD March 31. Rising star Nolan Gerard Funk (TV’s “Aliens in America”, X-Men 2) is charismatic Nikko, an all-around bad boy and wannabe rock star who, after being dumped by his band, is recruited by Spectacular, a high school show choir headed to the national championships to compete for top prize. All bets are off as the two musical worlds collide and Spectacular invents a whole new style that may spell disaster for their arch rivals. Nikko (Funk) is the next rock superstar and he plans to conquer the world with his band, Alloy. Courtney’s (Sursok) world revolves around her sequin-filled show choir, Spectacular. But when Alloy kicks Nikko out of the band and Spectacular loses their best male singer to a rival choir, Courtney convinces Nikko to join Spectacular. Will Nikko be the force that Spectacular needs to finally beat their rival choir, Ta-Da? Or will Nikko’s rock edge be too much for the glittery world of the show choirs? Spectacular! has a runtime of 90 minutes and is rated TV-Y7. o Behind the scenes look at the making of Spectacular! A perennial favorite of girls, ages 2-7 is Strawberry Shortcake. This spring offers a “berry” fun adventure when the sweetest traveler ever and her friends embark on new journeys in the all-new Strawberry Shortcake: Berry Big Journeys comes to DVD March 31, 2009. Featuring two fun-filled stories of new experiences, new travels and new challenges, “Strawberry’s Big Journey” and “Around the Berry Big World,” the pint-size loveable darling along with Angel Cake, Rainbow and new friend Banana Candy prove that a positive attitude and being with friends is the best time of all. “Strawberry’s Big Journey” – Strawberry Shortcake has always dreamed of seeing a certain rare flower, which only blooms once every ten years – and then only for a day. When she and her friends decide to go to see the flower, they load up a car and camper and set out for a long journey. The trip is not always easy – it’s full of unexpected complications and delays and they arrive mere moments too late and miss the flower’s bloom. Strawberry’s friends feel awful for her…she’s missed something that meant a lot to her. But Strawberry isn’t disappointed, the journey itself has been a grand adventure and she wouldn’t have missed it for anything in the world! “Around the Berry Big World” – After an inadvertent wager with Pie Man, Strawberry sets off to prove that she can go around the world in 80 days. She knows it can be done… if you have a positive attitude. Alas, a very negative Peppermint Fizz gets brought along by accident. Together, they overcome many obstacles — including Pie Man’s nasty attempts to sabotage the trip — and they make it back to Strawberryland in 80 days. You are currently browsing the Granny Ranny's Coming Attractions weblog archives for March, 2009.